The analysis and forecasts presented in this article are based on the analytical framework of W.D. Gann. Gann is an investing legend, labeled as genius by many financial historians. He reportedly accumulated $50 million in profits during his trading career. His superior track record and those of others using his methods argues that, regardless of our opinion of his methodology, we should heed the advice of his work. A more detailed explanation of his analytical framework is included in the last section of this article. The Dow Jones Industrial Average forecast, in the graph above, is based upon the natural 20-year cycle that Gann identified. The lines in the graph show the projected monthly cumulative percentage returns from the peak level. The yellow line is the average scenario and the aqua line is the pessimistic scenario. The graph provides monthly estimates for 2018. The last data point represents June 2020, which covers the entire 30-month period from December 2017. My average scenario forecasts a -15.29% price return for 2018. The cumulative price return is forecast to bottom in June 2020 at -20.39%, at which time an extended rally should ensue. My pessimistic scenario forecasts a -32.90% price return for 2018. The cumulative price return is forecast to be little-changed in June 2020 at -31.23%, at which time an extended rally in should ensue. The New York Stock Exchange (NYSE) began trading operations in 1792. However, the natural cause of the 20-year cycle first occurred in 1801. 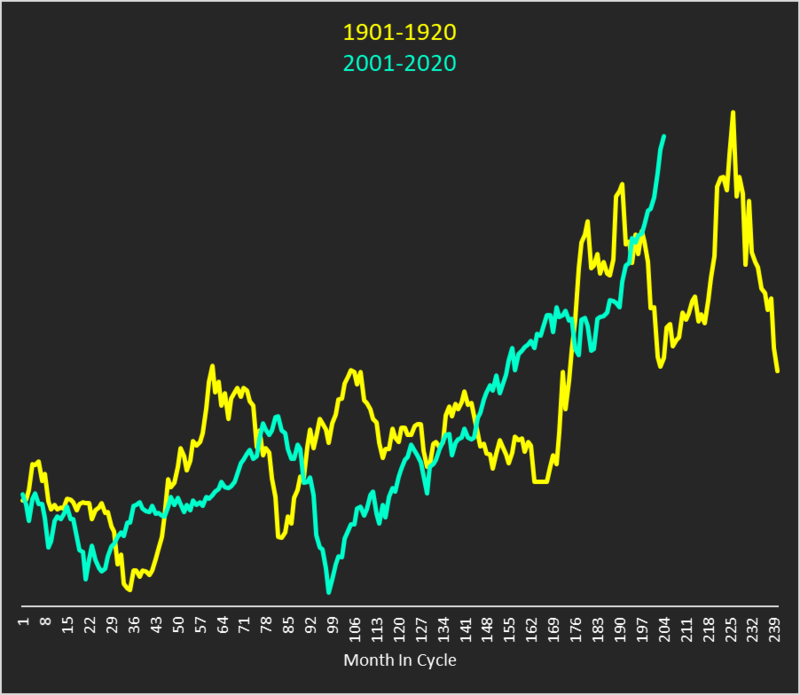 Accordingly, a proper analysis of the 20-year cycle must begin with 1801 as a starting point. The explanation for this is provided in the section entitled The Natural Cause of the 20-Year Cycle. 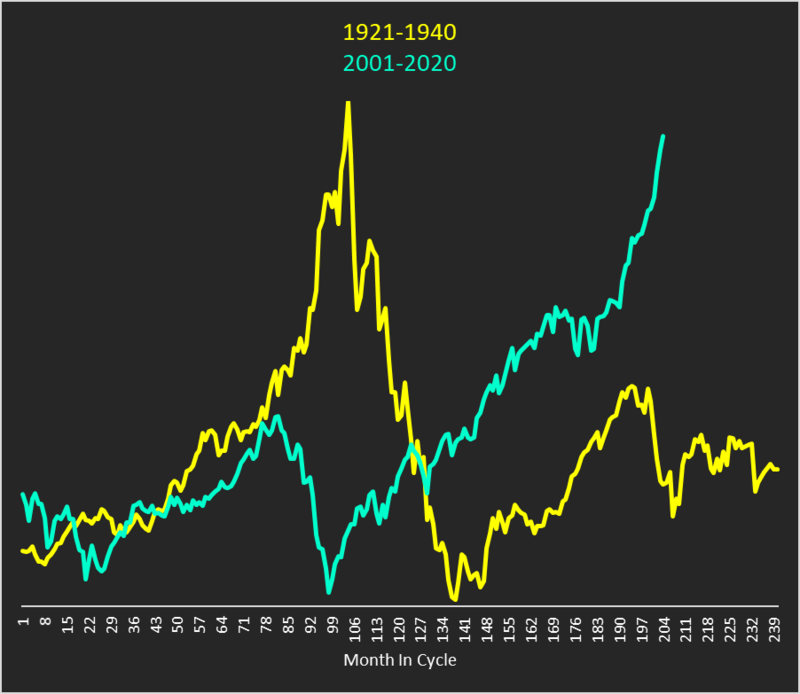 The 20-year cycles, from the inception of the NYSE, consist of the following time periods: 1. 1801-1820, 2. 1821-1840, 3. 1841-1860, 4. 1861-1880, 5. 1881-1900, 6. 1901-1920, 7. 1921-1940, 8. 1941-1960, 9. 1961-1980, 10. 1981-2000, and the current cycle 11, 2001-2020. Due to limitations of acquiring historical data, the data set of the Dow Jones Average used in this analysis consists of monthly closing prices beginning in January 1901, the sixth 20-year cycle. 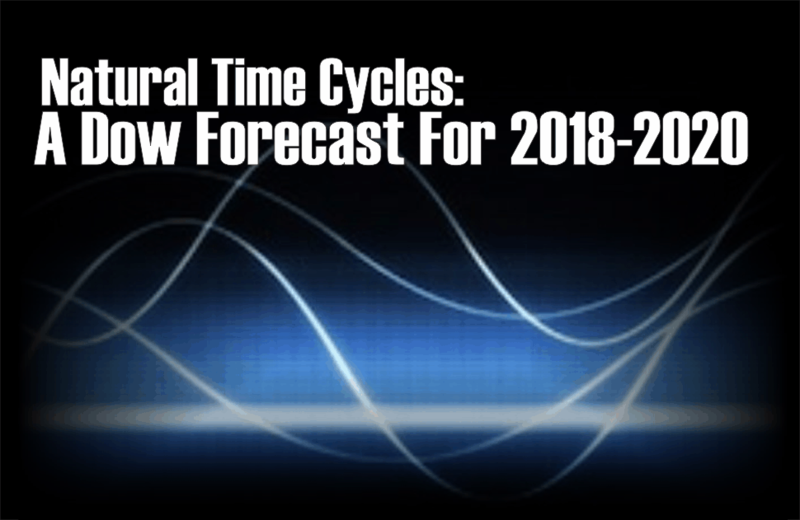 To use the data effectively and prepare a forecast, I compare the progression of the current 20-year cycle (2001-2020) with the previous five 20-year cycles, beginning in 1901. The following five graphs display the comparisons. Price levels are indexed to 1.00 in month 1 of the cycles and, although not labeled on the graphs, that is the scale of the Y-axis. As seen in the preceding graphs, the current 20-year cycle has some similarities and some differences with the five previous 20-year cycles. Based on that visual analysis alone, the individual correlations are not strong enough to base investment decisions on. Undeterred by the results from the individual comparisons, I built a composite 20-year cycle. 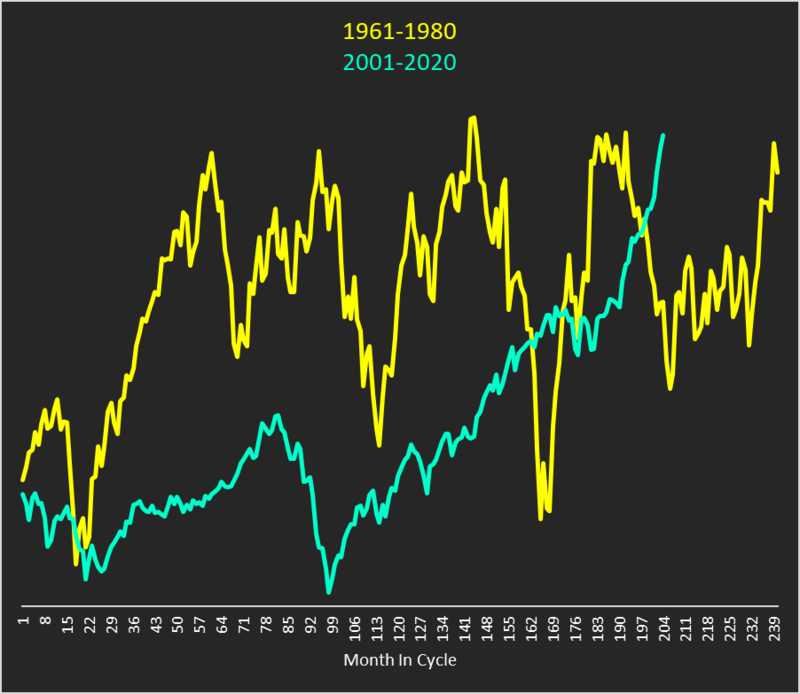 The components of the composite 20-year cycle are the five historical individual 20-year cycles shown in the preceding graphs. The composite 20-year cycle averages those five cycles and, importantly, does not include data from the current 20-year cycle. 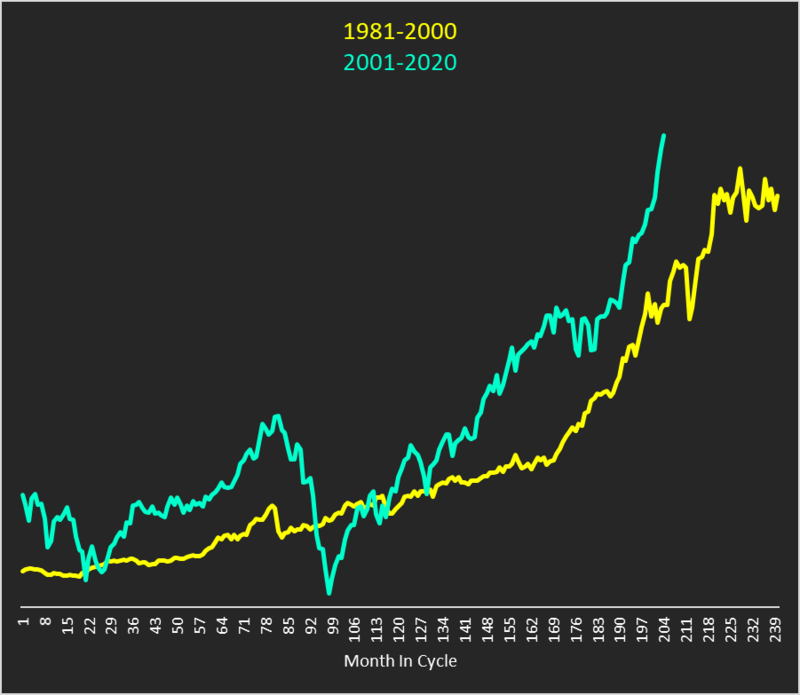 The following graph displays the composite 20-year cycle overlaid with the current 20-year cycle. Price levels are indexed to 1.00 in month 1 of the cycles and, although not labeled on the graphs, that is the scale of the Y-axis. Significant peaks and troughs are labeled as points 1-7 on both cycles. While the correlation of the current 20-year cycle to the composite 20-year cycle is strong, you may have noticed that the current 20-year cycle is progressing faster through peaks and troughs than the composite 20-year cycle. 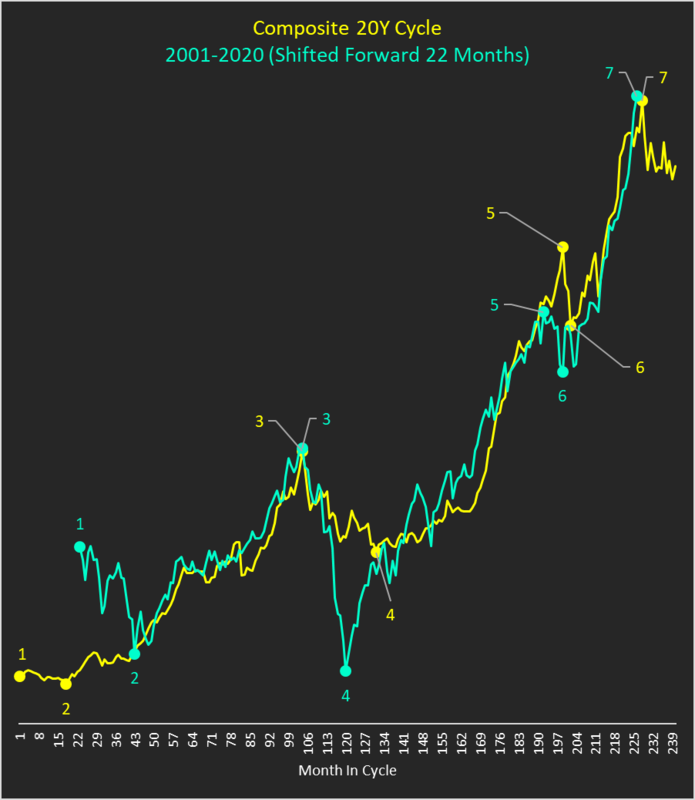 As a result, I “shift forward” (move to the right) the line of the current 20-year cycle by 22 months. With the data shifted, the timing of the peaks, troughs, and congestions are virtually identical. As displayed, the graph and data suggest that December 2017 is the peak of the current 20-year cycle. With the actual dates signifying the composite peak and trough for each historical cycle, I then calculated the percentage price returns between each point in the composite 20-year cycle for each historical cycle. This allows for comparison of differences in the magnitude of the price moves from point to point. The following table contains the results. The final step in this analysis and, the most important in preparing my forecast, is to identify what happened once point 7, the final peak of each 20-year cycle, was reached. Not only did I look at the following twelve months, but I continued the analysis into the beginning of the ensuing cycle (point 2 of the new 20-year cycle). Using the dates identified as point 7 in the preceding tables, I calculated cumulative percentage returns from the peak price level for each 20-year cycle. For the first year, these are calculated monthly. 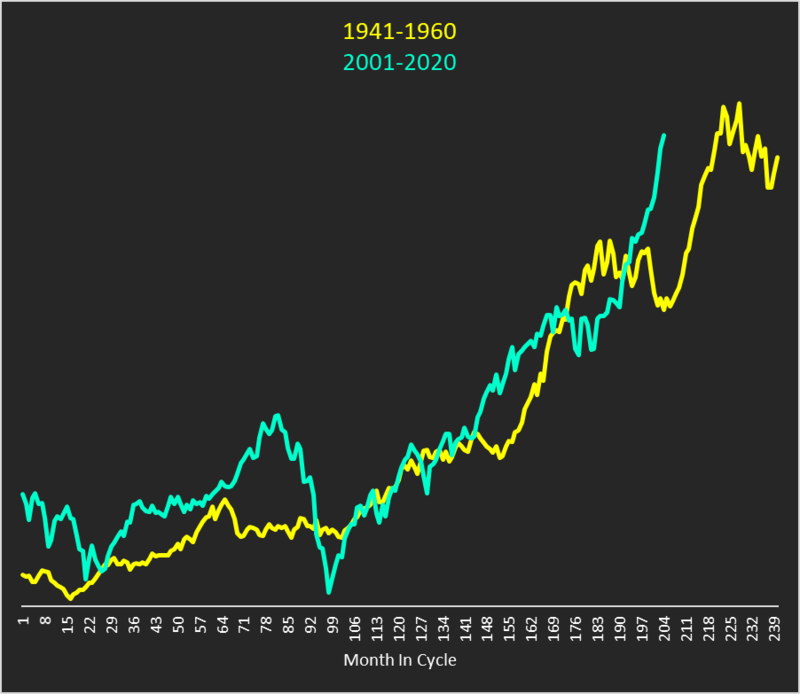 The final observation is labeled “Average Peak + 30 Months”, which is point 2 of the following cycle. Historically, after the low at point 2 is reached a rally begins which is extended in both price and time. The following table contains the results. In 4 out of 5 historical 20-year cycles, 80% of the sample, the cumulative percentage returns from the peak price level is negative in every month of the first 12 months following the peak. In 5 out of 5 historical 20-year cycles, 100% of the sample, the cumulative percentage returns from the peak price level is negative 30 months following the peak. One historical 20-year cycle, 1961-1980, stands out in the forward-return table due to its positive returns. The forward returns in this period include the months from January 1980 to June 1982. Five unique factors contribute to these positive returns: 1. demographic tailwind (the baby boomers were entering their prime earning and spending years), 2. tax-deferred retirement savings accounts were legally created in 1978, 3. mutual funds were relatively new and experiencing tremendous growth, 4. financial deregulation and, 5. consumer credit expansion was beginning in earnest. To prepare my Dow Jones Industrials forecast, the average scenario uses the average historical experience, excluding the 1961-1980 20-year cycle. The demographic and legislative factors listed above that bolstered returns in the early 1980’s are now largely turning into headwinds. Also, I hold the belief that financial deregulation and the resulting financial engineering has reached its zenith. Additional financial deregulation will have minimal benefits going forward. Lastly; consumers, state governments, and the federal government have accrued outstanding debt levels so large that make the continued growth of debt increasingly challenging. My pessimistic scenario uses the minimum percentage returns identified in the preceding table. Arguably, that may turn out to be conservative as my fundamental valuation model, alone, suggests a -65% decline is warranted. Michael Faraday (1791-1867) was one of the most influential scientists in history. He discovered the principles underlying electromagnetic induction, diamagnetism, and electrolysis. Faraday also established that magnetism could affect rays of light and that there was an underlying relationship between the two. This led him to study the magnetic properties of the Earth’s atmosphere. Faraday realized that magnetic energy emerges from the Sun and each of the planets in our solar system. Further, he explained how these planetary magnetic energies interact with one another, directly affecting how much of the Sun’s magnetic energy reaches the Earth’s atmosphere. He referred to these magnetic energies as “magnetic lines of force”. These lines are similar to the idea of Pythagoras’ strings. Pythagoras of Samos (570 BC-495 BC) was a Greek philosopher and mathematician. He is credited with many mathematical and scientific discoveries including the Pythagorean Theorem, Pythagorean Tuning, the five regular solids, the Theory of Proportions, the Sphericity of the Earth, and the identity of the planet Venus. He exerted a profound impact on the philosophies of Plato, Aristotle, and, through them, Western philosophy. Pythagoras believed that the universe was connected by strings. The strings were connected to the spirit world at the top and to the Earth below. What Gann was referring to was his belief, based upon the work of Faraday (which was influenced by Pythagoras), that as the planets in our solar system move through their orbits around the sun, the interaction of their magnetic lines of force changes the amount of magnetic energy from the Sun that reaches the Earth’s atmosphere. These changes affect every naturally occurring event on Earth, including weather, crop growth, and human psychology. Because of his belief, Gann spent his life researching how the positions of the individual planets and how the angular relationships of the planets relative to one another affected financial markets. Gann is also well known for his use of his number sequences in the form of squares, circles, and hexagons. These number sequences follow a defined mathematical relationship to one another. It is apparent from this discussion that Gann was both a scientist and a mathematician. He was financially successful in the application of his research, as evidenced by his published books, students of his correspondence courses, and his now famous 1909 interview in Ticker and Investment Digest. He reportedly accumulated $50 million in profits during his trading career. As I stated on page three, the 20-year cycle has a natural cause. This natural cause is the conjunction of the planets Jupiter and Saturn. A planetary conjunction occurs when the difference in longitude between to planets is zero degrees. If you were looking up into the night sky, the Earth, Jupiter, and Saturn would appear to be in a straight line. The actual amount of time between the conjunction of Jupiter and Saturn varies from slightly under 20 years to slightly over 20 years. From the list of historical 20-year cycles presented on page three, a conjunction occurred in the first year of the cycle every time. This explains why I used 1801 as the starting point of the first 20-year cycle. Using an ephemeris you can identify the location of each planet, and their angular relationships to one another, throughout history and infinitely forward in time. The next conjunction of Jupiter and Saturn will occur on December 21, 2020, signifying the start of the twelfth 20-year cycle. The power of technical analysis is in its ability to reduce multi-dimensional markets into a filtered two-dimensional space of price and time. Our methodology applies a consistent framework that identifies key measures of trend, distinct levels of support and resistance, and identification of potential trading ranges. Our methodology can be applied to any security or index, across markets, for which we can attain a reliable price history. We look forward to bringing you our unique brand of technical analysis and insight to many different markets. If you are a professional market participant, and are open to discovering more, please connect with us. We are not asking for a subscription, we are asking you to listen.